This deck has gone through 3 iterations, each bringing a different color identity. 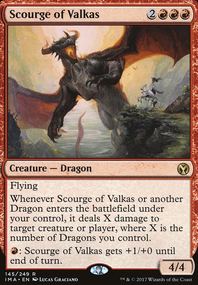 The deck started at Mardu with Zurgo Helmsmasher, then 4 color with Saskia the Unyielding, and now finally full WUBRG with Najeela, the Blade-Blossom. So a lot of the cards you have been in the deck at one point. 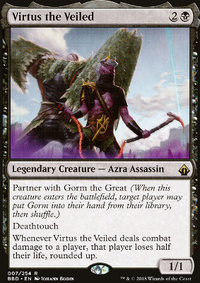 Aven Wind Guide is definitely a cards I need to think about, Brighthearth Banneret as well. Champion of Lambholt was in the running during the Saskia stage, but was cut because I didn't think it would do great, but it definitely would now. Rushblade Commander was under consideration as well, but looking back I should have cut Madrush Cyclops instead. Thrasher Brute will be considered as well. Aura Shards would be a good idea seeing as this deck has the capacity to produce tons of tokens. Settle the Wreckage is a nice instant speed board wipe, and you underestimate Insidious Will. 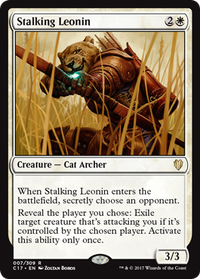 It is awesome to just turn someone's Path to Exile or other ambush effect when you are attacking and turn it against its caster. Card draw isn't a huge concern, but there is always a place for it. Both Obelisk of Urd and Door of Destinies were in here at a point, they will have to find a spot once again. You also underestimate Aggravated Assault I won't always have Najeela, and there is a possibility that I won't have WUBRG. Hazezon Tamar is mostly here for more tokens, and Dakkon Blackblade is a beast, he can get huge. This can draw attention away from other cards, or just do some damage. Ezuri, Claw of Progress, is a nice card. 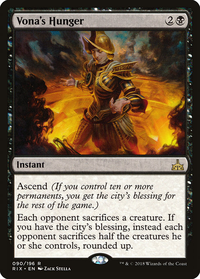 All these tokens that get produced give me experience counters, allowing me to dump counters on stuff until my opponents are forced to get rid of Ezuri. Jazal Goldmane is nice because if I have a lot of tokens it makes them huge. 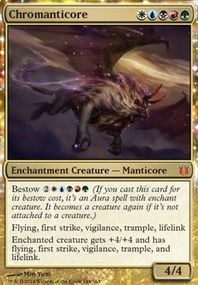 The +2/+2 affect of Bear Umbra is just a perk, the real power comes from the "When this creature attacks, untap all lands you control"
Thanks for the suggestions, this will help the deck advance and become better! This leaves you with 114 cards. Though I didn't really consider curve when I made these cuts so I don't know what will happen to that. Regardless, this would be my first pass at cuts. Wowzer, this has changed a lot! 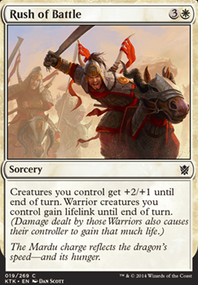 Mix of control, return, token, and strong aggression...i like! !Like the trickle pain, hope it works...Impact Resonance and Warstorm Surge may be worth considering. See you're still running Soulblast, did it work out? Dying Wish might be better than Rite of Consumption because it makes em lose life, and also you can later trigger as an instant with sac outlets -but you'd have to test to make sure. Ogre Battledriver instead of Madrush Cyclops...is Filth helping?Honestly though I like a lot, nasty! enpc on Dilemma- Oliva or Jund? Sleeper decks usually follow more of a combo route. Unfortunately playing powerful creatures will paint a target on your head pretty quickly. 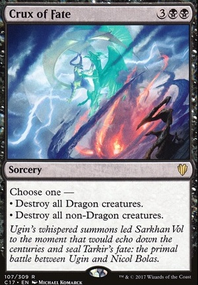 I mean, you could always do the whole Buried Alive fetching Avenger of Zendikar, Craterhoof Behemoth and Madrush Cyclops (or similar haste enabler) into a Living Death. Ends games pretty quickly. 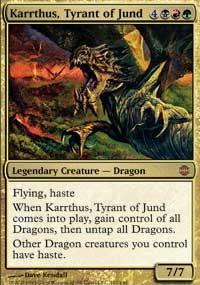 Adameus2012 on The State of Modern Dredge? 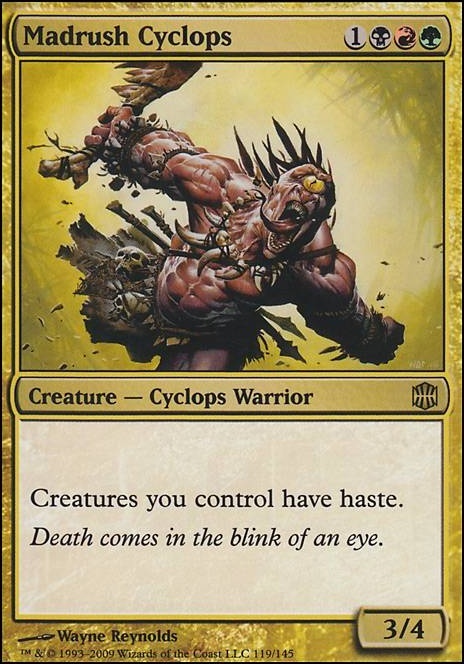 Madrush Cyclops seems the best to me as you can put it back on top of library with a Golgari Thug.